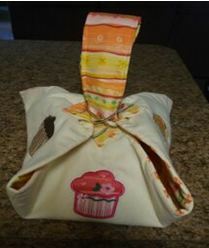 These casserole carriers are simple to make and are perfect for upcoming pot luck gatherings. 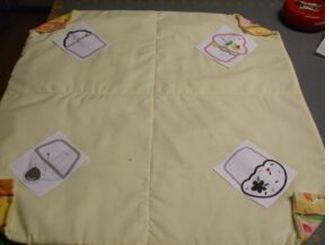 You can make them different by using an assortment of fabrics (maybe from your “stash”) and embroidery designs. Embroidery designs - Dakota Collectible Collections #970426 Redwork Memories and # 970443 - Crafty Cupcakes. 1. 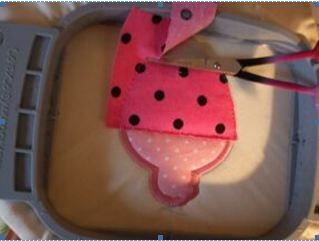 Place the right sides together of the 22 inch square fabric with the square of batting on the outside. Place pins around the outside edges to keep them even while stitching. 2. Stitch around the outside edge, leaving about 5 inches unstitched. 3. Turn the fabric to the right side through the hole you left unstitched. 4. That will leave the batting sandwiched on the inside. Slip stitch the opening together. 5. Press the square. Top stitch around the outside of the square. 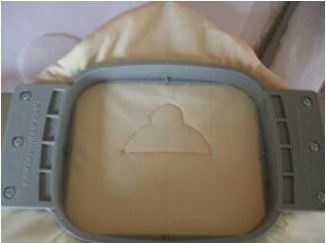 I stitched the width of the side of the pressure foot. 6. Mark a horizontal and vertical line through the center of the square so that you can follow them and straight stitch through all layers to hold the batting in place. 7. Using a printed template of your design, mark the position of the design in the corners of the square, leaving enough space for the corner to be folded down. I put a cupcake in each corner. 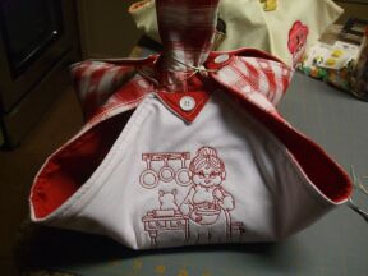 When using the redwork design, I only embroidered two corners because of the larger sizes of the designs. 8. Hoop the stabilizer and the corner of the square with the markings lined up in the center of your hoop. 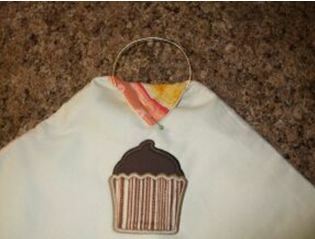 Stitch the first color of the cupcake design for a placement line. 9. Place a piece of fabric over the stitching and stitch the next color. Trim around the stitching as close to the stitching as possible. 10. 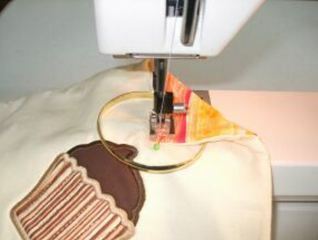 Continue stitching an outline, placing the appliqué fabric on top, stitching, trimming and finishing the embroidery design. Remove the stabilizer. 11. Embroider the other designs in the corners. 1. Place the fabrics for the handle together as you did on the square fabric and stitch the two long sides and one short side. Turn the handle right side out. 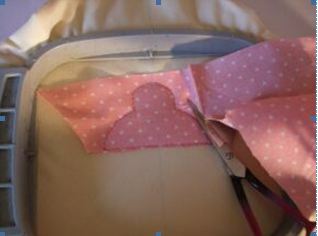 Fold the raw edges left on the short side to the inside and top stitch to close the opening. 2. Stitch a line down the center of the length of the handle or top stitch along each edge as done below. 1. Place the end of the handle under opposite corners of the square. Mark a line 2 inches from the tip of the corner and line that up a line marked 2 inches from the end of the handle. Stitch along the line. 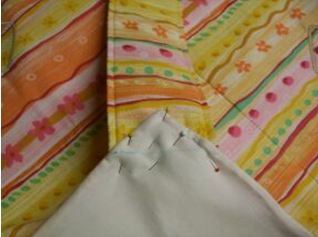 Fold the triangle shaped corner down and stitch the decorative button in the center. 2. For the corners of the square that do not have the handle stitched to them, fold the corner down the same measurement as the corners to which the handle was sewn. 4. 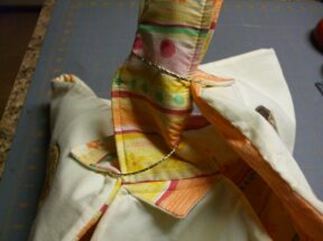 Sew your button on the triangle the same as the other corners. Please let me know any comments you may have below. Thanks! This is great. Think I have found what I'm making my family for Christmas, of course I'll have to put their name on the to make them even more special... Thanks for the idea. Love the technique shown-my daughter is learning to use her new machine and was asking about applique'. 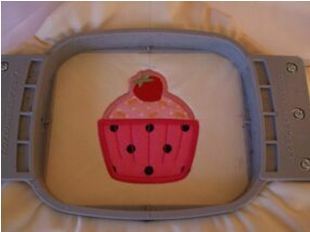 I made one of these a few years ago and it is my favorite casserole carrier. Super easy to make.